Secrets, Danger – and love? 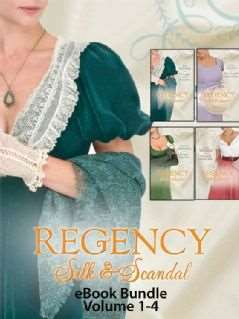 Book One in the Regency Silk and Scandal Series. Meet Nell Latham, a milliner who is not all she seems. Her life is hard enough – then a mysterious stranger with vengeance on his mind throws her into the path of the Carlows, a family with enough dangerous secrets of their own without the added complication of Nell and Marcus Carlow developing a tempestuous attraction for each other. At gunpoint. Nell the milliner is obviously ineligible as a bride for Marcus, Viscount Stanegate. 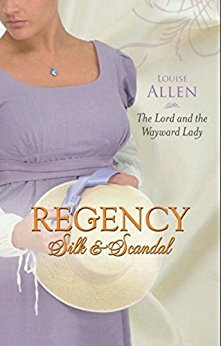 But their fraught courtship becomes lethally dangerous, for Nell’s true identity is a threat to both her and Marcus’s family and is the catalyst for revelations of scandal, murder and treachery that will resonate through all of the books in the series. The key was in the lock. Marcus turned it and went into the library, braced for almost anything. The woman who turned from her contemplation of the street was tall, slender to the point of thinness and clad in a plain, dark pelisse and gown. Her bonnet was neither fashionable nor dowdy, the impression she gave was of neatness and of frugality. As he came closer and noticed the tightness with which her hands were clasped before her and the rigidity of her shoulders, he realised that she was under considerable strain. ‘The butler told me to wait for Lord Stanegate. Are you he?’ Her voice was a surprise. Warm and mellow, like honey. Hazel eyes watched him, full of concern. Feigned? Why couldn’t I have thought of something more convincing? Nell stared back into the hard eyes, as dark as wet flint. He was too big, too serious, too male and far too close. She locked her knees against the instinct to edge backwards as she read the anger under the control he was exerting. ‘You are fortunate that he did not die of the shock. The Earl is not a well man, his heart is weak.’ There was the anger again, like fire behind the flint. A man who loved his father and was afraid for him. But what was there to fear in a rope? ‘Indeed? 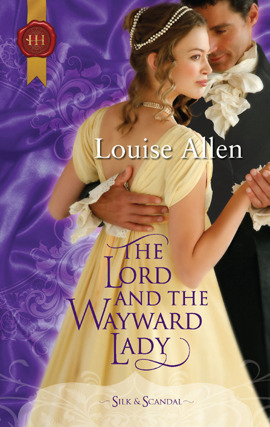 You hardly look like the sort of female to be employed delivering parcels.’ The viscount – she supposed that was what he was, her grasp of the ranks of nobility was escaping her under stress – folded his arms across his chest and looked her up and down. She knew what he was seeing. Shabby gentility, neatness and decency maintained by sheer willpower and a refusal to give in and allow her standards to slip. ‘His name?’ He did not seem to actually disbelieve her despite the sceptical line of that hard mouth. And it was true. Almost. ‘Really, Miss Smith? An excellent customer of your employer and you do not know his name?’ He moved closer, just a little, just to the very edge of discomfort for her, and narrowed his eyes. Nell lifted her chin and stared back, letting him see she was assessing him in her turn, refusing to be cowed. Almost thirty, she guessed, six foot, give or take half an inch, fit, confident, used to getting his own way. Was that because of his station in life or his inherent qualities? All she could tell of the latter, just now, was that he was an angry man who loved his father. ‘I hardly saw him and I think that was deliberate on his part. I do not think even Madame has fully seen his face. He always seems to come in the evening and he wears a slouch hat, his collar is turned up. He pays in cash, not on account. As she spoke, she realised she was letting her eyes run over the man in front of her, assessing the elegant simplicity of expensive tailoring and the fit, well-proportioned, body under it. He was dressed for driving in a dark plain coat and buckskin breeches with glossy high boots. She dragged her gaze back to the tie pin: there was something about the set of the strong jaw above the intricate folds of the neckcloth that suggested he was aware of her scrutiny and did not relish it. ‘I prefer not to give it. Madame would not be pleased if she found I had involved her in an awkward situation.’ And that, my girl, is where you get yourself when you lie. I cannot tell him now, not without admitting I do not work for a dressmaker, and then he will believe even less of what I say. ‘And if she is displeased, what is the worst she can do to you?’ The viscount moved away a few steps and half sat on one corner of the library table. Nell let out her breath, then realised that he had simply moved back to study her more closely, head to toes. ‘Dismiss me.’ Which would be, quite simply, a disaster. Not, of course, that a man like this would realise how precarious the life of a working woman was with no family, no other means of support. ‘A silken rope,’ he said slowly, with a weight to his words that made her feel she should read some significance into them. And at the back of her mind, sunk deep in her memory, something stirred, sent out flickers of unease as if at the recollection of a childhood nightmare. ‘Threats,’ she muttered, mutinous and increasingly afraid. ‘It would be threatening,’ he said, getting to his feet and walking towards her as she backed away, ‘if I were to force you back against the bookshelves, like this.’ Nell’s heels hit wood and she stopped, hands spread. There was nothing behind her but unyielding leather spines. Nell closed her eyes, trying to block out the closeness of him. Behind her, leather and old paper and beeswax wood polish were comforting scents from her early childhood. In front of her, sharp citrus and clean linen and leather and man. She tried to melt back into the old, familiar, library smell but there was no escape that way. She dragged her eyes open. He had shaved very close that morning, but she could tell his beard would be as dark as his hair. There was a tiny scar nicking the left corner of his lips and they were parted just enough for her to see the edge of white, strong teeth. As she watched he caught the lower lip between them for a moment, as though in thought. Nell found herself staring at the fullness where his teeth had pressed, her breath hitching in her chest. ‘No.’ The thought of his hands on her, sliding under her chin, his fingers slipping into her hair… And the memory of Mr Harris came back to her and she shuddered, unable to stop herself, and he stepped back abruptly as though she had slapped him. Nell saw, from both their faces, that a little anxious was a major understatement. Without a word Lord Stanegate turned on his heel and strode out after the man. The door banged shut behind him.